Secretary of State John Kerry announced on Wednesday that a text had been agreed on between the US and the government of President Hamid Karzai concerning a post-2014 role for US troops in the country. It still has to be approved by a Loya Jirga, a gathering of 2000 notables and clan leaders. The details of the agreement have not been released publicly and won’t be until the Loya Jirga votes. Karzai’s government had wanted to included an “apology” from the US for its “mistakes” during the occupation of Afghanistan, but Kerry maintained that Karzai never brought it up in the final talks and said firmly it was not in the text nor would an apology be forthcoming. Days before the so-called bi-lateral security agreement heads to an Afghan council of elders and political leaders for a final decision, the U.S. is attempting to force through a stipulation that would allow U.S. troops to continue raiding Afghan homes, in addition to measures giving U.S. troops and contractors immunity from Afghan law and extending U.S. military presence far beyond Obama's 2014 pullout date. 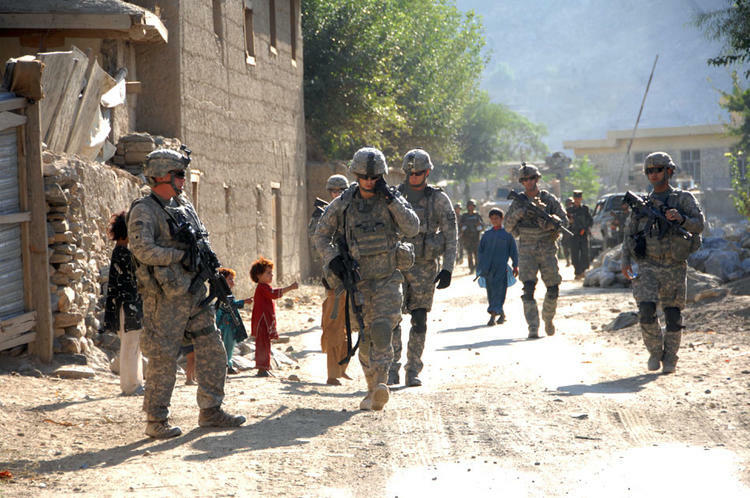 Critics charge that the U.S. is giving itself the green light for open-ended occupation at the expense of the Afghan people. "Occupation is not defined by how many occupiers are policing someplace," said Kimber Heinz of the War Resisters League in an interview with Common Dreams. "If you reduce the amount of occupation forces but keep them there forever, then the occupation continues and the war on people's everyday lives is not actually over — no matter what the US government or mainstream media tells us." The U.S. is pushing for the right to enter Afghan homes over the initial objection of Afghan negotiators. The New York Times reports that President Hamid Karzai's spokesperson, Aimal Faizi, announced Tuesday that Karzai would allow U.S. home raids in "extraordinary circumstances." He said this was in exchange for an agreement from President Obama to issue a letter apologizing for mistakes in Afghanistan. This latest development follows attempts on the part of U.S. negotiators to ram through immunity for U.S. troops and independent contractors from Afghan law. According to The Washington Post, the U.S. appears to have succeeded in including this immunity in a previously-circulated draft of the agreement. The accord will head on Thursday to Afghanistan's loya jirga, a gathering of 3,000 elders and political leaders who will spend days deliberating over whether to accept the agreement. An Afghan official told The New York Times that Karzai is willing to try to convince the loya jirga to accept this immunity. The issue of immunity for U.S. troops has long been a point of contention for the Afghan people, who have faced a staggering civilian death toll, as well as a spate of high-profile massacres, including the 2012 Panjwai massacre, in which 16 Afghan civilians were gunned down and killed, and 6 wounded by U.S. Army Staff Sgt. Robert Bales. "Immunity is just another extension of occupation," Suraia Sahar of Afghans United for Justice previously told Common Dreams. A draft text of the agreement dated July 25th, 2013, does not specify how many U.S. troops will be allowed to remain in Afghanistan, likely giving the U.S. unilateral power to determine this number. Furthermore, the document does not prohibit the U.S. from using Afghan territory to launch drone strikes against nearby Pakistan, The Washington Post points out. The U.S. has framed the raids and continued troop presence as part of an ongoing special operations force to hunt down "terrorist" cells. “The Parties acknowledge that continued US military operations to defeat al-Qaeda and its affiliates may be appropriate and agree to continue their close cooperation and coordination toward that end,” the July 25th draft agreement states. Yet critics charge that this is just occupation by another name. "The 'counter-insurgency' and paramilitary tactics employed in Afghanistan that require fewer ground forces are also being developed for use by armed forces and militarized police units all over the world, including in the U.S., making resistance to the U.S.'s latest strategy for global dominance imperative," said Heinz.